The Palm Beach GT50 Open will debut at the 2019 Miami Yacht Show. The all new Palm Beach GT50 Open takes the bold line from this builder in a bracing new direction, and will make its first appearance at the 2019 Miami Yacht Show. 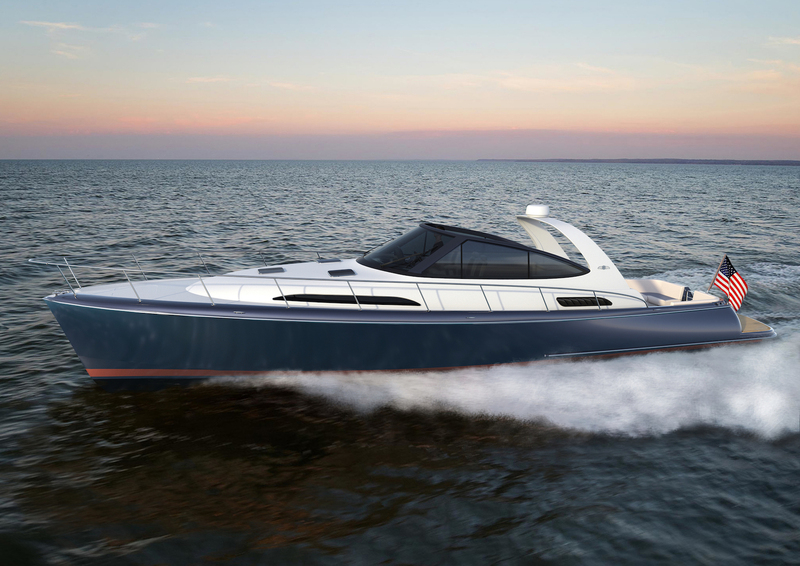 Palm Beach Motor Yachts is building on the success of its GT50 Salon Express with the launch of the GT50 Open, taking the same well-matched hull and propulsion package of the original GT50. Beneath a forward-swept radar arch, an amidships social area has facing settees: An L-shaped settee to port is served by a dining table, while a straight settee to starboard adds to the gathering space. Forward is the command station to starboard, served by helm and companion seats, while a pair of additional forward-facing companion seats are positioned to port at the same elevated height to enjoy excellent lines of sight. A carbon-fibre windscreen wraps around the area, allowing the crew to enjoy the day in comfort even as the boat realises her exhilarating performance. A portable sun awning provides shelter when needed but disappears when not in use. On the helm deck, there is forward-facing seating for four. Lightweight, strong construction helps to ensure the GT50 Open’s efficiency. The hull is a fully infused vinylester cored e-glass construction that is complemented by a fully infused, 100-percent carbon fibre deck and superstructure. The bulkheads and deck are bonded to the hull structurally for increased strength and rigidity, forming a semi-monocoque shell that produces a far stronger result. The cockpit features an additional refrigerator and an ice maker to complement the full-service galley below. Side decks are designed to join the cockpit seamlessly to allow for easy access forward. Below, a broad selection of designer double-stitched fabrics are wrapped around a spacious forward master stateroom, huge head with shower, large galley and a queen-sized berth aft. Engine access is beneath the helm deck. “The GT line is meant to offer a yacht that will help continue to set us apart in terms of performance, efficiency, and easy ownership, all in the one beautiful package,” Richards says. Palm Beach is underway on production additional models for the GT line, including a GT60 that will make her debut in September of 2019. Performance projections of the 60 are calling for high-40-knot top-end. A GT70 is also in the design process will follow the introduction of the GT60.